Eating cherries can reduce the risk of gout attacks, a study has suggested. US researchers found patients with gout who ate cherries over a two-day period had a 35% lower risk of attacks compared to those who did not. The study in Arthritis & Rheumatism said cherries contain anthocyanins, antioxidants which contain anti-inflammatory properties. 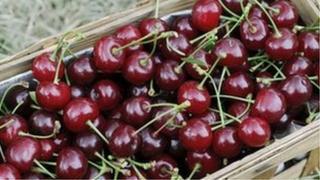 UK experts said the research offered "good evidence" of the benefits of eating cherries for people with gout. Gout is a common type of arthritis that can cause sudden and very severe attacks of pain and swelling in the joints, particularly in the feet. It is caused by too much uric acid in the bloodstream, which causes urate crystals to start to form in and around the joints and under the skin. Gout affects about one in 100 people, with men two to three times more likely to be affected than women. In this study, researchers from Boston University recruited 633 gout patients with an average age of 54, who were followed online for one year. Most were male. People were asked to record gout attacks including symptoms, the drugs they used and their diet and drinking patterns in the two days prior to the attack, including whether or not they had eaten cherries or cherry extract intake. Ten to 12 cherries was counted as one serving. During the period the patients were studied, they had a total of 1,247 gout attacks. Some 42% of those studied ate cherries or cherry extract. These patients had a 37% lower risk of gout attacks than those who did not eat the fruit - in any form. However, the benefit was only seen when eating up to three servings over the two days prior to an attack. Further cherry consumption provided no extra benefit. But when patients ate cherries or cherry extract and took the common anti-gout drug allopurinol, the risk of attacks was 75% less than if they were doing neither. Writing in the journal, the team led by Dr Yuqing Zhang, said: "Our findings indicate that consuming cherries or cherry extract lowers the risk of gout attack." Prof Alan Silman, medical director of Arthritis Research UK welcomed the research: "It has been thought for some time that some fruits, in particular cherries, may have benefits for diseases such as gout and rheumatoid arthritis which are characterised by chronic inflammation. "It has been suggested that antioxidant compounds found in cherries may be natural inhibitors of enzymes which are targeted by common anti-inflammatory medications such as ibuprofen." Prof Silman added: "This study provides good evidence to suggest that cherry intake, combined with traditional uric-acid reducing drugs, can significantly reduce the risk of painful gout attacks. "Eating cherries, in fact, is not dissimilar to taking ibuprofen on a daily basis. "However, we'd like to see additional clinical trials are necessary to further investigate and provide confirmation of this effect."